Pittsburgh in the summertime: one big green blanket. Oakland house and hillside (from Panther Hollow). The grass, it turns out, was a lot greener back home. Summers out West are well-known to be sunny, beautiful seasons. Even still, Portland was going on fifty-nine straight days without rain by the time this blogger touched down last month. In his eight days in Oregon, there was just one light sprinkle to break the streak. Like a Zen koan, it happened over night when there was no one even awake to witness it. The rare grass patch that wasn’t bone dry and scorched pale yellow had to be getting daily attention from a hose-wielding lawn-obsessed gardener. You won’t get that in Pittsburgh where a walk in the summer can often feel like swimming standing up. 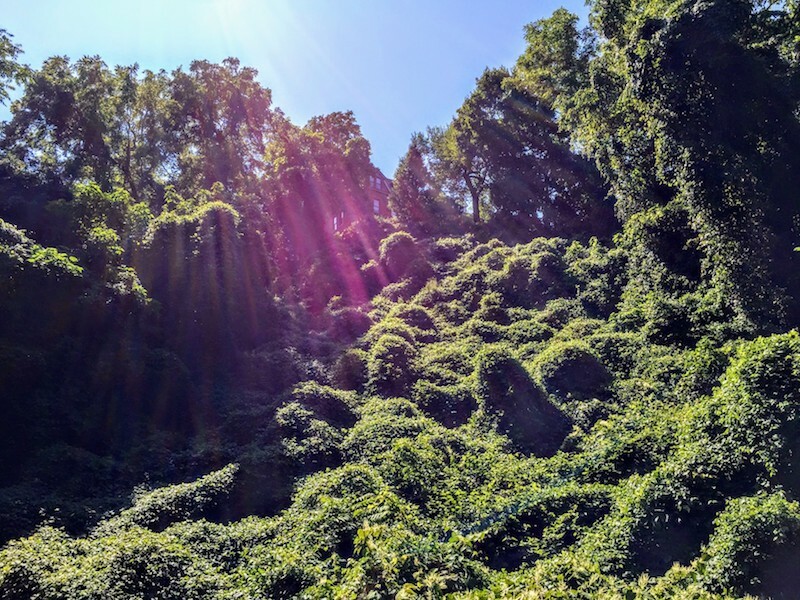 But the off-the-charts humidity here sure does make the grass–and tomatoes, raspberries, trumpet vine, knotweed, sunflowers, and everything else with a leaf and a root–grow like it’s been fertilized by nuclear worms. That lush, unbroken carpet of green was the first thing we noticed from the tiny cabin window during the decent to Pittsburgh airport. Pittsburgh and Portland share a lot more than they differ. Both are mid-sized, post-industrial, suddenly-on-the-national-radar cities. Given that, we can’t help but compare them–plus, it’s a good excuse for an Orbit story. Last week, we looked back on this recent trip with both respect and envy for some of Portland’s nuts-and-bolts urban accomplishments and comfortable living [at least, if you don’t have to come up with the rent check]. This week: the corollary. It’s easy to get caught up in the newness and romance of a vacation spot, but what did we appreciate all over again coming back home? 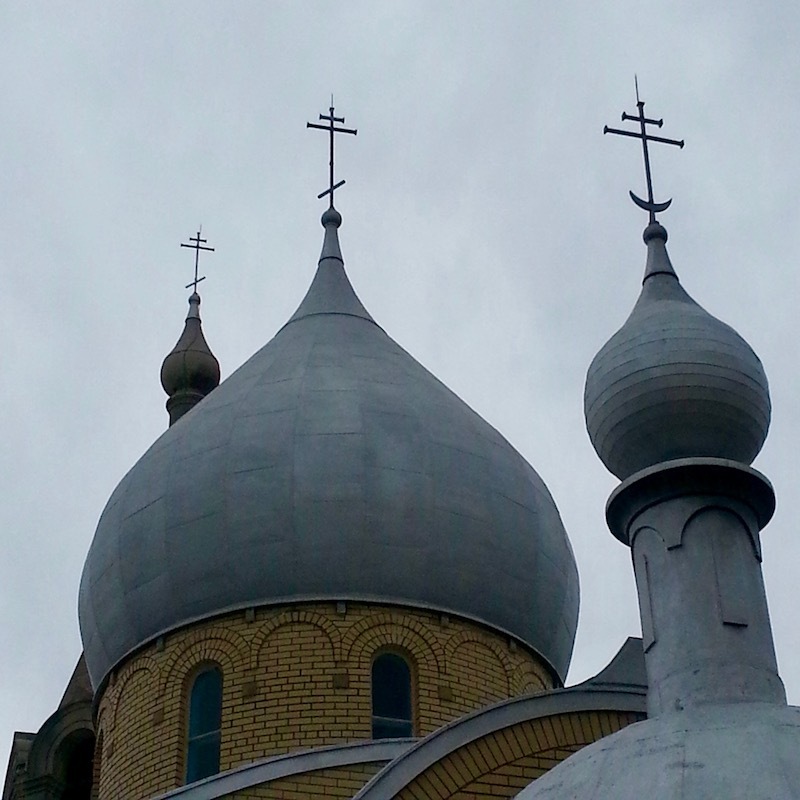 Recently, we rode the Orbitmobile from the mingling hoards of off-their-nut Steelers fans down at the stadium up to the Polish Hill home of Simeon Larivonovoff, the last in a line of Russian icon painters going back 659 years. In between and en route, we purchased one of Sunseri Brothers’ enormous “atomic” pepperoni rolls–an $8 expense that supplied three ample, mindbendingly-delicious meals (and one minor case of heartburn). One of these endpoints was indeed a reporting trip [more about this, later]. Regardless, it only occurred after-the-fact how typically Pittsburgh the whole experience was. Our compact little city, where nearly everything can be navigated by bicycle in 15- or 20-minute jaunts, is filled with and over-abundance of strange histories, brilliant views, criss-crossing cultures, bargain thrills, and intense civic boosters–yes, especially when it comes to sports. There they were, all wrapped up in one little happenstance mile-and-a-half ride. The thing is, it could have been any day, heading in any direction. Pittsburgh’s infrastructure–designed by billy goat, operating under the Department of Cattywumpus–ensures we all get to negotiate the jumble of weird streets, steep topography, and the dead-ends of benign neglect almost anywhere within the city. Without even trying, pretty much any detour, reroute, or casual exploration is going to get strange. 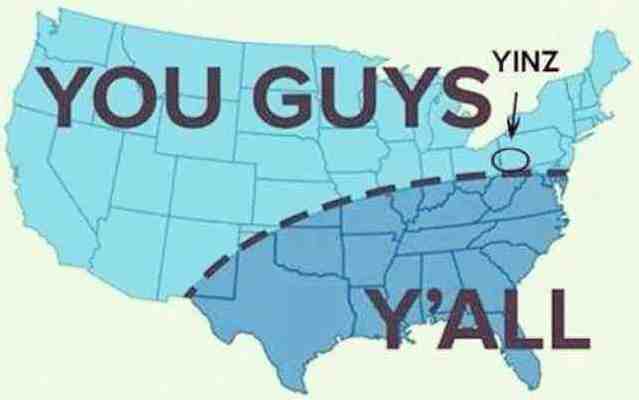 Pittsburgh is both geographically and culturally at the exact midpoint between East Coast, Midwest, and Appalachia–and yet it’s none of these, really. But for the people who live here, that’s probably a fair cross-description of personality stereotypes. Generally, Pittsburgh people are warm, funny, goofy, nebby, fired-up, and attitude-free. Yes, we are also legendarily cheap and–to the chagrin of some–football-obsessed. Terrible kilts, great people. 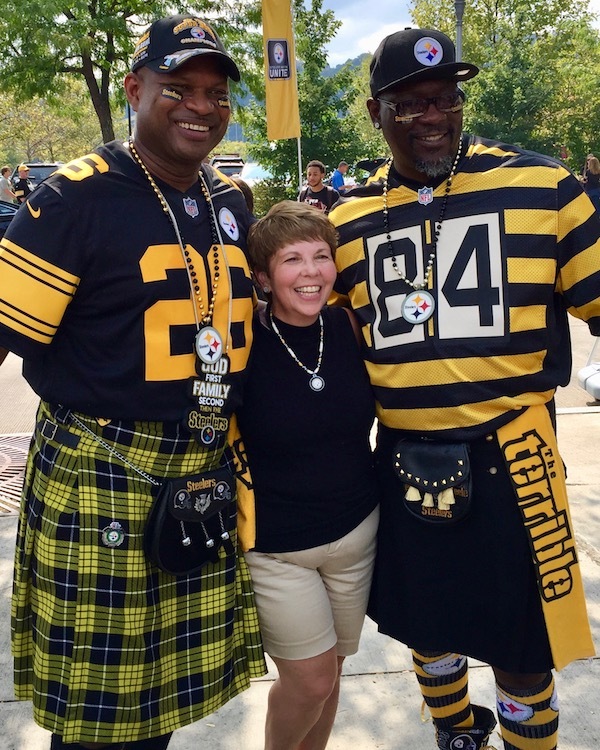 Steelers fans, Heinz Field. And what about that city-to-city comparison? Portland is a really fine town whose biggest problem seems to be self-inflicted–it’s a victim of its own success. So what did we miss about Pittsburgh? What have we got going for us? In a phrase, it’s a sense of place. Pittsburgh has it in such many and deep ways that we’ve dedicated this entire web site to celebrating and documenting our unique city. This turned into a terribly difficult piece to write, just because the subject is too near and dear, too much to discuss, too hard to boil down. I’m going to drown you with pronouns now. Somewhere along the way in that trip out West, I found myself feeling like there just wasn’t the kind of there there that we have here. Portlanders speak with no discernible accent–except possibly a vague California LiteTM upspeak. Pittsburgh is home to a unique American dialect that is so hyper-local it really only extends to the Allegheny County line. There’s a whole lexicon (famously, “yinz,” “redd up,” “sweeper,” “gumband,” “jumbo,” etc. ), unique accent, inflection, and the dropping of that pesky verb to be. Portland is a foodie town where everything is “locally sourced” and comes with a narrative that would sooth the Brontës. 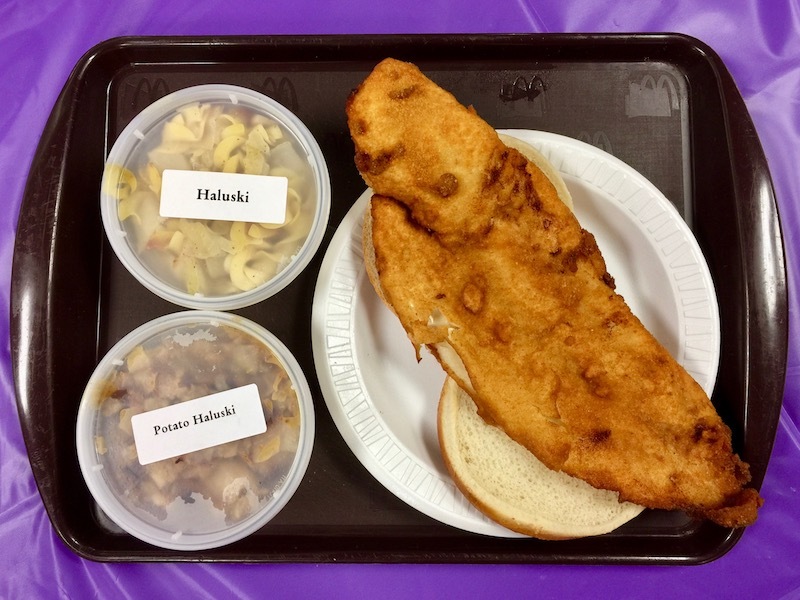 Yet no one could name a weirdo regional food equivalent to the steak salad, city chicken, Primanti’s sandwich, Lenten fish, or The Devonshire. Brestensky Meats will sell you a seven-pound kielbasa in the shape and size of a regulation football–complete with laces. Heck, we’ve got a whole series going on weird pizza. Like Pittsburgh, Portland has plenty of defined neighborhoods, but frankly, they’re really indistinguishable. Everything east of the Willamette River is basically flat and adheres to the same approximate giant street grid. Nearly every lot has a single detached house with its own yard. The locals don’t even seem to bother–everything is just referred to by its off-bias quadrant: “Northeast”, “Southwest”. Apparently one quarter of the city’s educated white liberals are more snobby and another’s are more laid back, but man, I’m telling you–it’s a stretch. In Pittsburgh, when you go between neighborhoods, you know it. There’s a new street system (if there’s any pattern at all), the block sizes and architecture all change, the names and faces go from Italian to Polish, Jewish to African-American, students to old-timers. You probably crossed a bridge or climbed a steep hill to get there. A couple areas are fancy-fancy; others have more vacant lots than standing buildings. Outside the city, it’s a whole other layer of distinct. The old industry towns carry the same fascinating boom-and-bust history, but are now so hauntingly beautiful and heartbreakingly tragic that we feel honored and lucky to be witness to what often feels like the last gasps of their painful denouements. High culture. 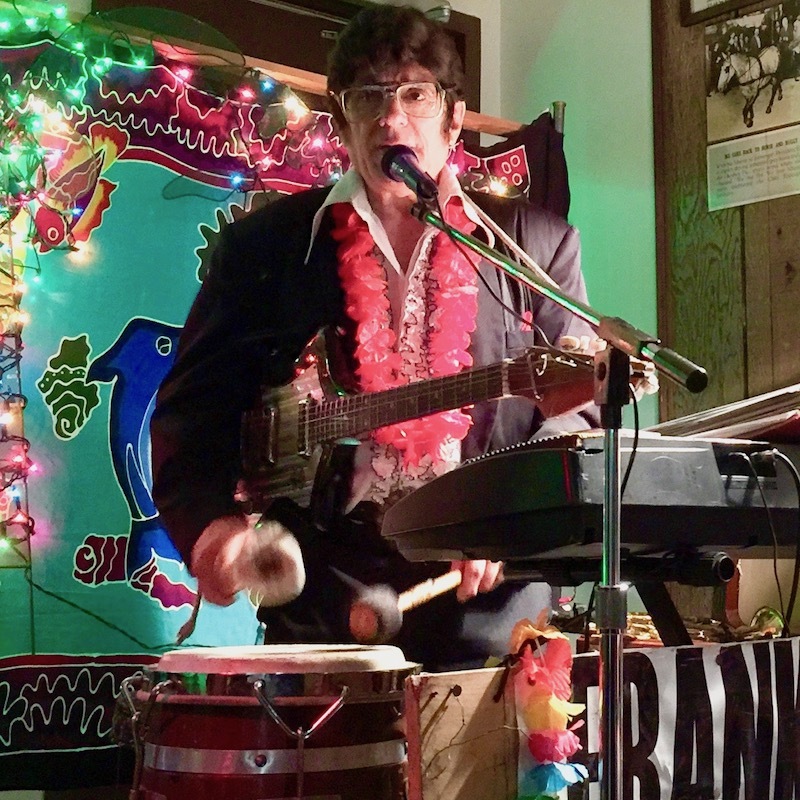 Frankie Capri, performing at the Original Oyster House, 2016. In a word, Pittsburgh is just kooky. 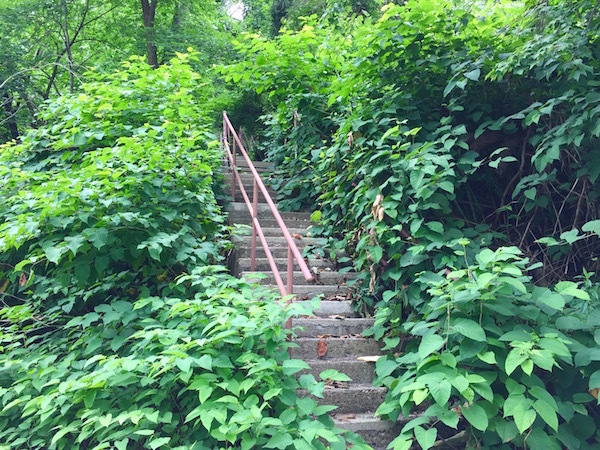 I’m really happy to live in a place where stair steps disappear into vacant hillsides so overgrown they’re impassible. A place so comfortably out-of-touch that stirrup pants and Zubaz will always be in fashion. I want to live where there are five ways to get anywhere, and they’re all wrong. 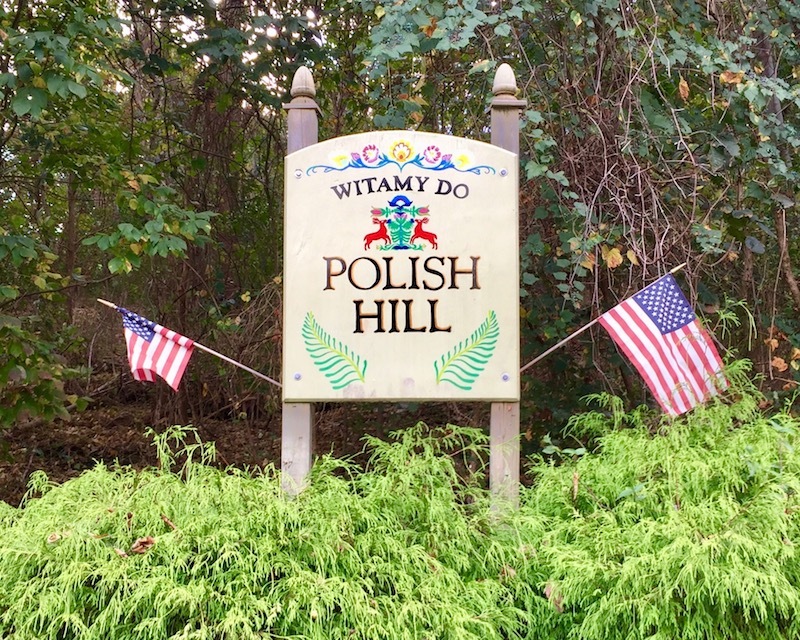 Where names like Zatwernicki, Freyvogel, Scoglio, Kusmircak, Blosl, Czegan, Fabijanec, and Walkowiak seem normal–the Smiths, Jones, and Williams are the weirdos. I hope this is always a place you can buy kluski and pretzel salad from older ladies with blue hair and babushkas in Catholic church basements, where children win national marbles championships year-after-year, where strangers hug, high-five, share beers, and tell tall tales because they’re all wearing black-and-gold. Pittsburgh, I’m glad to be home. Yeah, me too. I [pretzel heart] Pittsburgh. Love this piece! After 9 years in Portland I’ve just moved to Pittsburgh, and I’m thrilled. It was a treat to read your observations comparing the two. I would never have moved to Oregon for Portland itself- the whole point of it in my opinion is to have a metro area with half decent Indian food near all that spectacular nature. At least when the nature isn’t on fire. But sadly you just don’t get what you’re paying for there anymore. Here’s what I don’t get: when we tell people we moved here just because we wanted to be here, Pittsburgh natives give us weird doubletakes and demand some kind of further explanation. And honestly I can’t wait to get my PA plates because my car gets far too many points and stares. I’ve pulled over a couple times to check if there was something wrong with the rear of my car, but no, just Oregon plates. Happens in parking lots too so I know it isn’t that it’s surreptitiously emitting purple smoke. I read somewhere that Pittsburgh does not want or seek attention for its superiority. Maybe that’s it? Anyway Pittsburgh has a lot more of what makes a city great, for sure! Laura, Welcome to Pittsburgh! 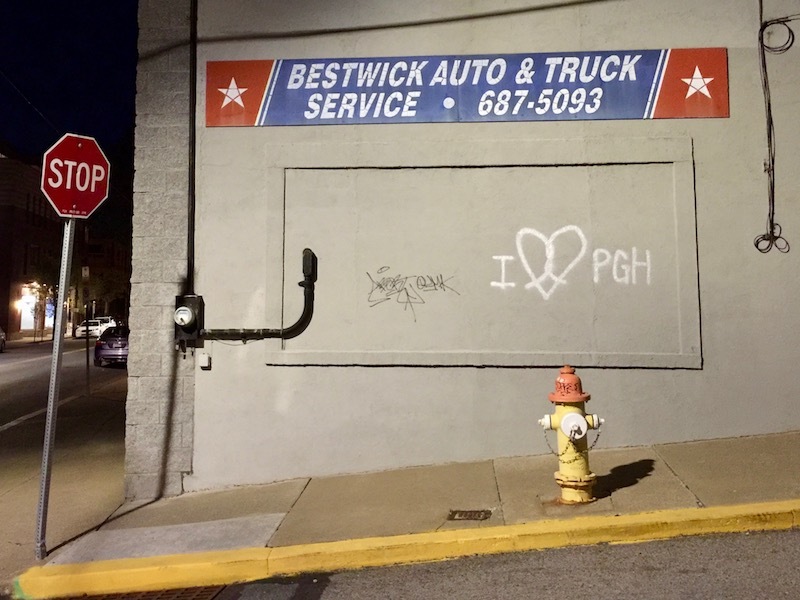 You make a good point–and one that probably should have been in the list of Pittsburgh characteristics: there is a real city-wide sense of low self-esteem that you’ll see again and again. There are probably a lot of reasons for that, but my personal theory is that it comes from the fact that the city has lost well over half it’s population in the last half decade, we’ve gone from this economic powerhouse that was at one time one of the 10 largest cities in the country to what is now dangling tenuously to “second-class” and “mid-sized” amid a population that would generally prefer sunnier/warmer/glitzier locales. Sigh. Just reading this now but couldn’t move on without mentioning how beautiful this piece is and how grateful I am for this whole blog. 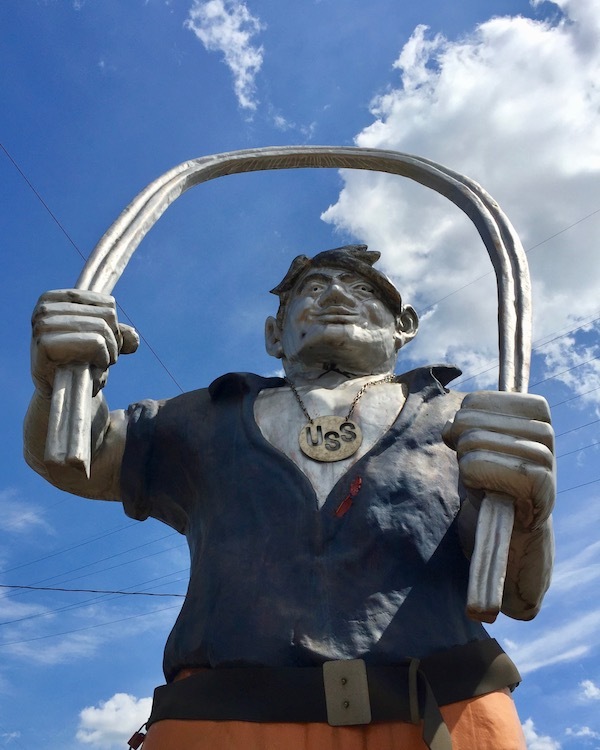 I’m a recent transplant and am not ever sure I’ll ever feel – or really want to feel – like a native, but your work helps me build appreciation for this kooky city. For that, thank you! E: Thanks for the kind words–and welcome to Pittsburgh!